ESSEC is one of the leading European Business Schools, and a French “Grande Ecole” with three campuses, one in the Paris metropolitan area, one in Singapore, and one in Morocco. It offers graduate level training in business administration (MSc, MBA, Executive MBA, Specialized Masters, PhD, etc.). Its Master in Management (MiM) program was ranked #3 worldwide in the last Financial Times ranking. ESSEC gathers a wide ecosystem on data-related topics, with many initiatives, partnerships, skills and capabilities. 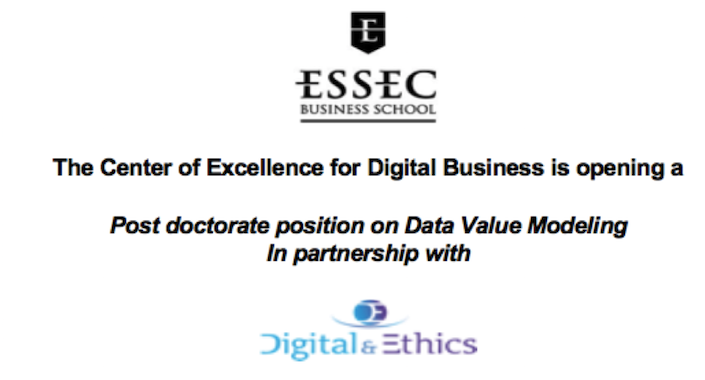 The Center of Excellence for Digital Business, in partnership with Digital & Ethics, opens a full-time post-doctorate position to conduct research on data valuation modeling. This research is fundamental with experimental development in accounting, marketing, finance, law or economics. The position is open for the Paris campus, located in Cergy-Pontoise. The Center’s mission is to produce and to diffuse knowledge on business transformation in a digitalised world. More generally, its mission is to coordinate all ESSEC activities in the digital domain and develop additional initiatives in terms of research, teaching, corporate support or participation in public debates. Digital & Ethics is an Innovative Enterprise specialized in issues related with the protection of privacy, when dealing with Data. D & E offers a wide spectrum of services including the consultancy in ethic and legal issues related to the release of personal data and providing customers with software solutions on personal data re-identification risk evaluation. Nowadays, D & E aims at enlarging its activities to cover the analysis of the value of data. D & E looks for developing knowledge in order to create data valuation software solution. Digital platforms are ubiquitous and in the process of taking over the global economy. Those companies fund their growth on the collection, treatment and monetisation of data. As Lev (2014) emphasises, intangible assets, such as data, are becoming strategic resources driving long-term competitive advantages. The biggest platforms have indeed billions of users, benefit from huge network effects and growth, and account for more than $2.6 trillion in market capitalisation worldwide. But if data can be monetised, what is its value? In this new economy, data is key, yet there is no generally accepted model for pricing or even valuing data. We know that data is an intangible asset and informational goods. But the actual definition of data is still unclear. And among the issue related with data valuation is the question of data ownership, governance and usage rights. Our research aims at framing those issues better and proposing a general model for data valuation. Such a model would be useful for any company dealing with data, which is the case of most companies nowadays. There will be applications to accounting (data value as an asset of the company), marketing (the value of customer-generated data and advertising-based models), finance (the value of the data-centric company itself), law (rights and regulation related to data markets), and economics (investigate market mechanisms of this new type of asset). The model would also be useful for developing software solutions of data valuation. Disseminate research findings, in particular through peer-reviewed publications, white papers destined to industry practitioners and academic conferences. The final purpose of such papers being to be accepted in top ranked academic journals. Manage, in coordination with Prof. Nicolas Glady, the research project. In particular, manage the relationship with the research partners and contribute to the organisation of the project events. Post doctorate is required to be in residence for the duration of the appointment. The dates of the employment relationship can be negotiated, starting at earliest in September 2017. The position is offered for a period of 1 year and is renewable. We are looking for a highly motivated junior scholar whose research interests and skills are aligned with the Center’s objectives. We are particularly interested in candidates who believe that academic excellence and practical relevance should go hand in hand. Doctorate or Ph.D. in Information Systems, Technology Management and Innovation, Strategy, Economics, or Accounting & Management. Fluent English. French is a plus but is not mandatory. Prof. Nicolas Glady (Director of the Center) will supervise the research project in collaboration with Digital & Ethics, the partner of this project. Qualified candidates should send their applications to champion@essec.edu, including (1) a letter of application/research statement, (2) a detailed curriculum vitae including the list of publications (if relevant), (3) a job market paper, and (4) 3 letters of recommendation. We will continue to accept applications until the position is filled.